Every picture tells a story. Cuche is in agony after taking a tumble in Slovenia. (CNN) -- Switzerland's Didier Cuche could miss the Vancouver Winter Olympics after breaking his thumb in a World Cup giant slalom in Kranjska Gora on Friday. Cuche, one of the favorites in that discipline and, in particular, the super-G and downhill, hit the penultimate gate on his second run at the event in Slovenia and slid across the finish line after taking a fall. The Swiss ski federation said the injury put his participation in the Vancouver Games in doubt. Cuche, the super-G world champion from Val D'Isere earlier this year has returned to Switzerland and will have surgery in Zurich on Saturday. "More details regarding possible consequences for participation at the Olympic Winter Games will be available after the operation," the federation said in a statement. The race was won by Ted Ligety of the United States with Austria's Marcel Hirscher and Kjetil Jansrud of Norway in second and third. Another Vancouver hopeful, Bode Miller, missed the race to rest his sore ankle ahead of the Winter Games. The 35-year-old Cuche is at the peak of his powers in this advanced stage of his career, having won both the super-G and downhill on the famous Hahnenkamm in Kitzbuehel, Austria, last week. 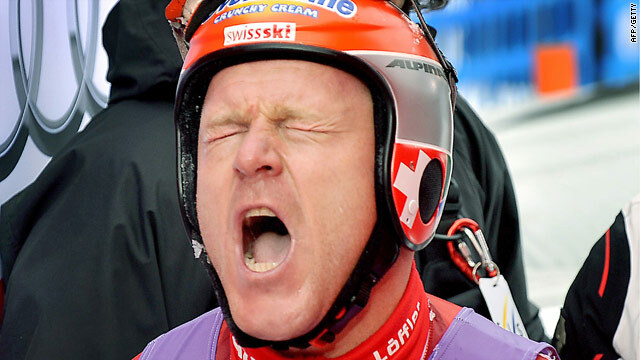 He has won a total of 13 World Cup titles -- six in downhill, four in super-G and three in giant slalom, but only one Olympic medal, a silver in Nagano in 1998. The men's downhill is the opening Alpine Skiing event in Vancouver on February 13. In other World Cup action on Friday, Anja Paerson won a super-combi event in St.Moritz with American ace Lindsey Vonn in third place. Vonn, tipped to be the golden girl of the Vancouver Games, extends her overall World Cup lead over German Maria Riesch who failed to finish the two discipline event over super-G and slalom.